Damage to heritage site. Copyright: SANA. 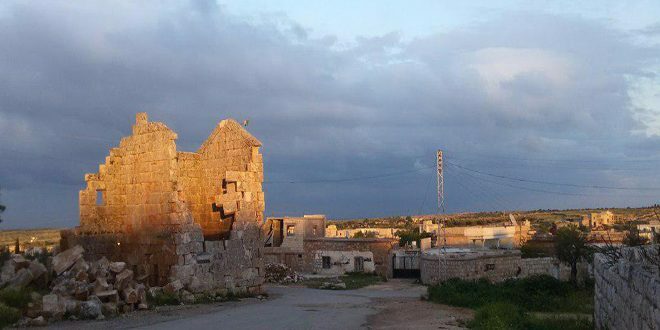 The DGAM condemns the destruction of the Deir Sunbul archaeological site in Idleb. This Roman and Byzantine site dates back to the 2nd – 6th centuries. Read more on the DGAM’s website here and on SANA website here. Reports of shelling in Bab Touma in Old Damascus, leaving at least one dead, and unconfirmed reports via Twitter of damage to the World Heritage site. Read more on the Syrian Network for Human Rights website here. Mitteldeutscher Rundfunk (MDR) examines how trafficked Syrian antiquities are sold in Germany (25 October 2017). Details on the Conflict Antiquities WordPress (English) are here and Mitteldeutsche Rundfunk website (German) here. The Journal Gazette writes about Syrian-Americans who use music to maintain a connection with their homeland and heritage here. The Daily Sabah reports on a new exhibit at Istanbul Ayvansaray University, featuring contemporary Syrian artists whose works explore their cultural heritage and Syria’s history. Exhibit open 12 December – 24 December 2017. See details here. The DGAM have begun work restoring the Gateway and stairs to Aleppo’s citadel, here. Damage assessments of the Gate of Victory, which was severely damaged in the conflict, have led to the discovery of a previously unknown flight of stairs leading to the roof. Read more here. Work is ongoing to catalogue the inventory at the Idlib Museum, here. Students are being taken on to help prepare the museum for reopening, here. Alaraby TV reports on their work here. A video of the work of the Idlib Antiquities Centre’s awareness raising work is available here, and photos here. The seventh round of negotiations on Syria is tentatively scheduled to take place on Oct. 30-31 in Astana. Read more on the Latin American Herald Tribune website here. Specialists from the Institute for the History of Material Culture at the Russian Academy of Sciences have created a 3D model of Palmyra. Read more on the TASS website here. A new Memorandum of Understanding in Italy will establish a lab to help authorities “detect and unmask fakes and forgeries and aimed at teaching and scientific research related to cultural heritage.” Read more on the Art Crime Blogspot here. The Fifth Session of the Global Platform for Disaster Risk Reduction (GP2017) took place from 24 to 26 May 2017 in Cancun, Mexico. The deliberations of the 2017 Global Platform are now summarized in the proceedings which are available online here. The BBC explores the question of “Who clears up the wreckage of natural and man-made catastrophes and where does it go?” here. The 18-20 October 2017 conference Preserving Cultural Heritage in Times of Conflict at Colgate University featured ASOR CHI’s Allison Cuneo and The Day After Heritage Protection Initiative (TDA-HPI) Founder Amr al-Azm. Learn more and see photos on Facebook here. The Sound and Picture website discusses future reconstruction of Raqqa, including the possibility that “it may be easier, safer and cheaper to rebuild a new Raqqa next to the old one rather than attempting the laborious and dangerous task of removing explosives, rubble and contaminated materials.” Read more here. The New York Times reports that archaeologists have used Google Earth to expand on research from two decades ago, discovering 400 stone “gates” extending from Saudi Arabia through to Jordan and Syria. Read more here. Dawn features the Aga Khan Museum’s Dr Henry Kim who discusses the Aga Khan Museum and Syrian heritage here. ABC Radio Australia cites Aleppo Project fellow AlHakam Shaar, who says that the return of the displaced is an important condition for successful reconstruction of Aleppo. See it here. The Art Newspaper questions whether IS actually receives as much funding from antiquities sales as many claim. “Although several allegations were attributed to Western law enforcement authorities, no one is identified, so they can’t be checked.” Read the full article here. The 3D Print website writes about the Institute for Digital Archaeology’s 3D rendering of the Arch of Triumph, which won the Public Engagement with Research Award from the University of Oxford earlier this year. For more details, see here. The Express Tribune discusses the books of Dr Ross Burns, former Australian ambassador to Syria. “With my writing I am trying to debunk the theory that Aleppo is destroyed. I can think of no better gesture than to restore the everyday life for the people of Aleppo.” Read it here.